Titanium Stethoscope: Typically used for aerospace and surgical applications, titanium is 2X as strong as aluminum and 45% lighter than steel! Constructed completely in titanium for its high-strength to low-weight ratio, biocompatibility, non-toxicity, and highly corrosion-resistant properties, the MD One® EpochTM is super light-weight, exceptional in performance, and remains rust-free for year after year of clear, unadulterated acoustics. Adult and Pediatric Convertible Chestpiece: TThe patented adult and pediatric convertible titanium dual-head chestpiece is precisely designed and hand polished for superb performance and durability. With the MD One® EpochTM, you can quickly switch from adult or pediatric configurations with full spectrum low and high frequency modes. The patented full-rotation acoustic valve stem features SoundTightTM GLS technology that helps glide and lock your chestpiece in place, assisting in the sealing of sound. The green indicator dot also allows the user to easily identify the active sound channel. Acoustic Pyramid Chamber®: A patented internal metal-alloy chamber located in the acoustic tubing below the spring keeps the tubing channel open for maximum sound transmission into the headset. Included Accessories: 2 extra sets ComfortSeal® eartips, spare ultrasensitive diaphragm, and ID tag. Adult and Pediatric Convertible Chestpiece: The patented adult and pediatric convertible titanium dual-head chestpiece is precisely designed and hand polished for superb performance and durability. With the MD One® EpochTM, you can quickly switch from adult or pediatric configurations with full spectrum low and high frequency modes. The patented full-rotation acoustic valve stem features SoundTightTM GLS technology that helps glide and lock your chestpiece in place, assisting in the sealing of sound. The green indicator dot also allows the user to easily identify the active sound channel. 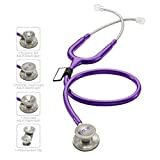 This entry was posted in Buy Supplements and tagged Epoch, MDF®, MDF777DT08, Purple, Rain, Stethoscope, Titanium by TOSMS. Bookmark the permalink.